Number and placement of weapons may vary based upon weapon size. 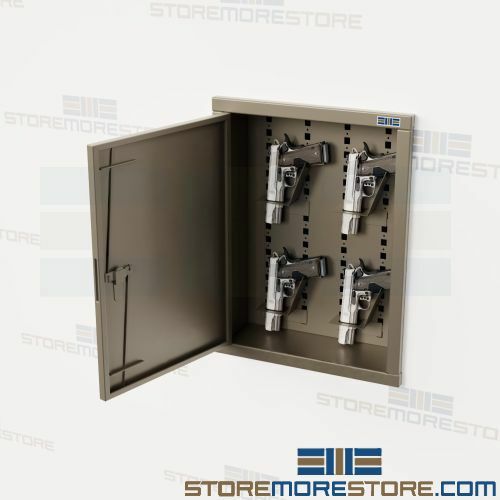 Pistol wall cabinets with digital locks are provide secure and discreet storage for pistols and long guns, ammunition, and other weapon accessories for police and military departments, government and state facilities, and more. 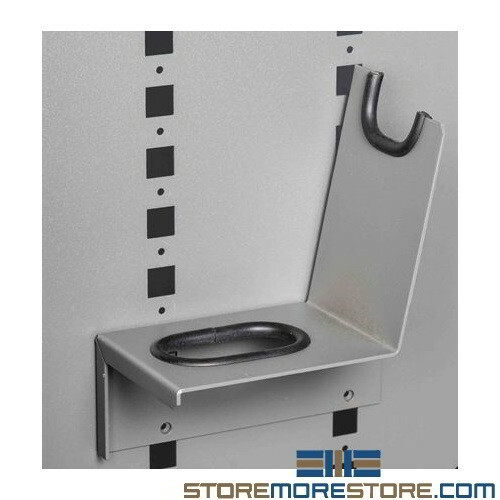 The color options above make this item a "Special Order Item". 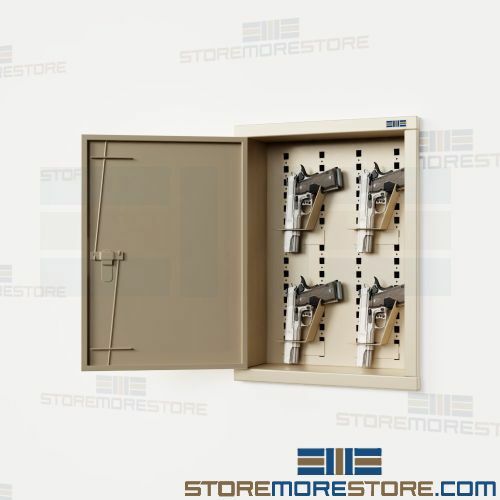 These gun cabinets are designed for recess mounting into the wall for secure and discreet weapon storage. 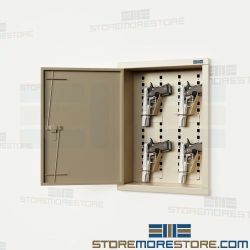 Available in multiple sizes and configurations, the gun lockers can store pistols, AR-15s, ammunition, accessories, and other weapons in one place. 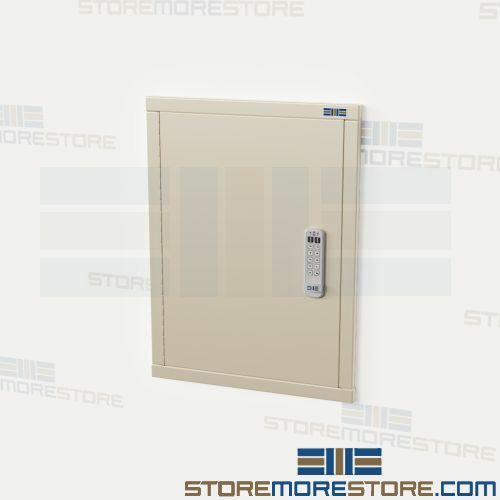 Sizes: Available in widths or 16" and 24"; heights of 18", 36", and 54"; and depth of 4"
Doors: Full-height piano-hinged 16-gauge steel door with 1/4" diameter steel locking rods. 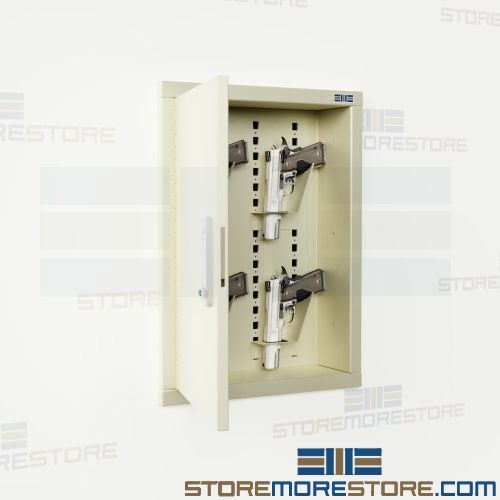 Doors can be changed from left to right hinged in the field. Locks can be set to "station" or "locker" mode at any time. Powered by two AAA alkaline batteries which can operate for 4 or more years. LED on lock will flash to indicate low battery level. Locks include 5-digit master code for management security. 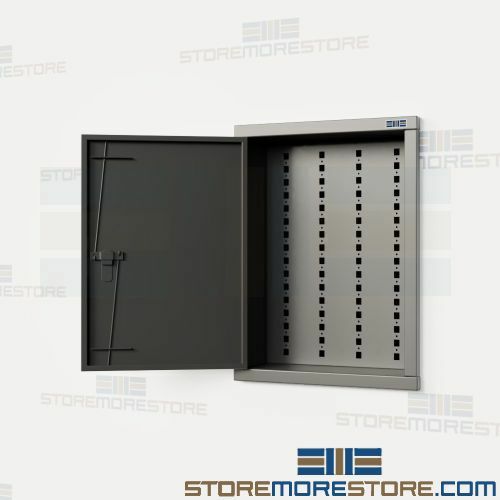 User can lock and unlock any available locker door with a user-selected 4-digit code. To reopen the locker, user enters the 4-digit code to unlock the door. After locker is reopened, the PIN code is erased, and the locker is available for the next user. User enters a pre-programmed 4-digit code to unlock and use the locker repeatedly. Lock does not require a code to relock door.